she has been thru many custume changes. So I'll go with the latest. Yes it is completely slutty...but she just has been thur a bad break up...and is trying to attract a mate. She is a intelligent wolf turned into a human and has very little understanding of human culture...anyway enough back story. She is young pretty girl with straight blond hair that goes about to the mid back. Her eyes are the only thing unusual about her appearence being canine yellow. Her current custume is a black skirt with black fishnet stockings. 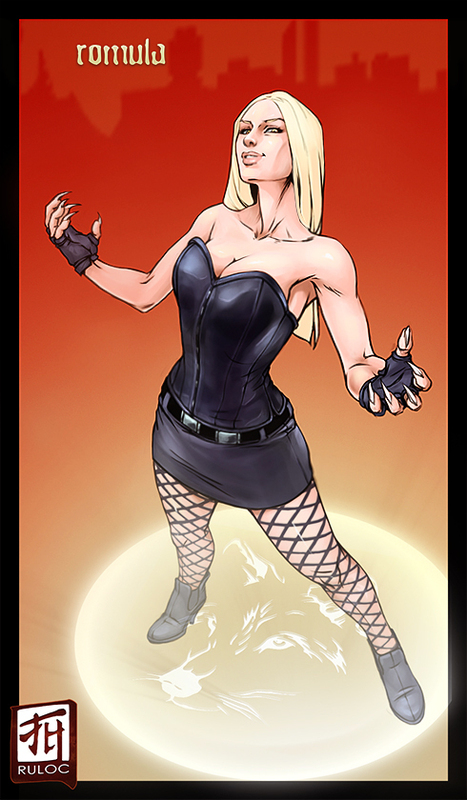 Her top is a black leather corset with a black leather high heel low boots and wears fingerless gloves and has claws. She is a wolf shamen that cast spells...or if you could have a ghostly image of a wold in the drawing that would be great.